Over the past year Banele has been building up an arsenal of carpentry skills. Under the guidance of Roger, who heads up the Healthy Village Project, he has gone from knowing virtually nothing about working with wood, to completing projects on his own. 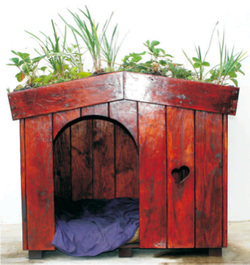 Using mainly chunky, reclaimed wood from packing crates, he has created beds, benches, book shelves, coffee tables and even a kennel with a living roof. To cap it all off, he is now in the process of applying for a Small Business Management Diploma through Tsiba. With such success, we are increasing the number of participants. Banele, now a mentor, passes on his knowledge to the next generation of carpenters. In the future we also hope to extend this programme by offering apprenticeships in agriculture and construction.